Greenberry® was founded to offer environmentally friendly alternative products that are made from renewable and sustainable materials whenever possible. We strive to incorporate materials that easily go back to nature without toxic effects and to minimize any damage to our planet. 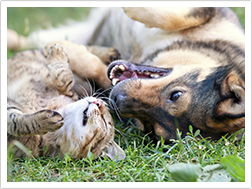 Greenberry has developed environmentally friendly products that are the answer when it comes to being responsible and keeping your pet happy and well balanced. We use only safe natural materials which go back to the earth as nature intended. You can rest assured knowing you’ve made the right decision using our pet products for your Home, your pet and the planet!